We read the review article "congenital triangular alopecia (CTA)" with great interest, which was published recently (Int J Trichol 2015;7:48-53). We appreciate the authors for their efforts on extensive search and analysis of this rare and less known disorder. A total of 126 cases have been reported till January 2015 worldwide. All these cases have been compiled beautifully by the authors. As CTA is a rarely reported entity, it is important to report each and every case seen. In our extensive online search, we did not find any new case of CTA reported after January 2015; therefore, we are presenting here the 127th case of CTA which we came across a month back. 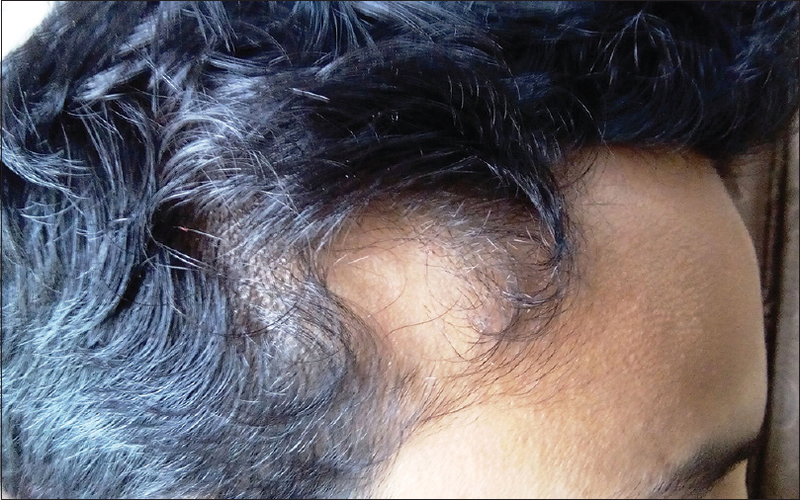 A 19-year-old male presented with a single patch of hair loss located over the right frontotemporal region of the scalpfirst noticed at early childhood, which remained persistent since its appearance [Figure 1]. There was no history of trauma or any other associated disorder. Parents were nonconsanguineous, and no family members were similarly affected. On examination, the patch was triangular to the oval of approximately 6 cm × 3 cm in size on the right frontotemporal regions with apex toward the vertex. On dermoscopic view alopecic area contained almost a normal number of hairs, although virtually all were vellus and no single terminal hair was found within the patch. At the margins, there was a transition zone containing both vellus and terminal hair. Therefore, there was no clear-cut margin of alopecic patch. Systemic examination was absolutely normal. Histopathology could not be performed as the patient did not consent for the same. The patient had diagnosed as a case of alopecia areata previously and treated with topical steroids without any benefit. We prescribed him topical minoxidil 5% to apply twice daily as it has shown to improve hair growth on the patch of CTA. Possibility of satisfactory cosmetic result with follicular unit transplantation was also discussed with the patient, as it may give long-term satisfactory and sustained result. CTA usually manifests at 2–5 years of age, but may present at birth or develops in adulthood. Usually presents unilaterally, rarely seen bilateral in 20% cases. Actual incidence is not known probably because the lesions are benign and nonprogressive, therefore, less reported. Moreover, many cases are misdiagnosed and treated for alopecia areata. An analysis in 6200 patients revealed 7 with triangular alopecia. Genetic basis of CTA is not yet clear. However, its association with phakomatosis pigmentovascularis may provide evidence that it may originate from loss of heterozygosity. A heterozygous individual could be phenotypically normal. It may be a predominant trait. Several familial cases have been described, but the usual presentation is sporadic. Androgenetic alopecia and alopecia areata are important differentials. In fact, androgenetic alopecia makes the diagnosis challenging if presented in overlap with CTA. As there is no specific treatment for this rare condition, the main aim of this article is to register the 127th case of CTA and also to sensitize and enlighten other practitioners about this rare case to prevent inadvertent use of steroids in such cases. Unger R, Alsufyani MA. Bilateral temporal triangular alopecia associated with phakomatosis pigmentovascularis type IV successfully treated with follicular unit transplantation. Case Rep Dermatol Med 2011;2011:129541. Trakimas C, Sperling LC, Skelton HG 3rd, Smith KJ, Buker JL. Clinical and histologic findings in temporal triangular alopecia. J Am Acad Dermatol 1994;31 (2 Pt 1):205-9. Trakimas CA, Sperling LC. Temporal triangular alopecia acquired in adulthood. J Am Acad Dermatol 1999;40 (5 Pt 2):842-4. García-Hernández MJ, Rodríguez-Pichardo A, Camacho F. Congenital triangular alopecia (Brauer nevus). Pediatr Dermatol 1995;12:301-3. Happle R. Congenital triangular alopecia may be categorized as a paradominant trait. Eur J Dermatol 2003;13:346-7.